When people think of mechas in anime, they automatically think of shows like Gundam, Macross, Code Geass, Neon Genesis Evangelion, and even Tengen Toppa Gurren Lagann. They think of flashy combat (sometimes with lots of missiles), lots of action, explosions, more fights, lots of gutsy shouting, etc, etc. Of all the shows on offer though, very few actually portray mechs as something..... utilitarian. 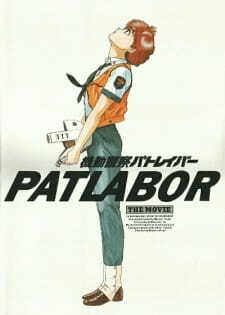 Released in 1989, Patlabor: The Movie (the name is taken from the Patrol Labors used in the show), followed the story set by the original 7 episode OVA from 1988/9, and featured a completely original story written by Headgear (a group of 5 writers and artists who work in anime and manga). Produced by Studio Deen, Production I.G. and Bandai, and directed by Headgear's own Oshii Mamoru, the movie received critical acclaim from a broader public spectrum than any other at the time, in particular because of it's "novel" use of all things mecha. The movie, set in Tokyo in 1999, begins with a man throwing himself off a giant steel structure in Tokyo Bay. The structure is called The Ark, a man made island where the Babylon project is coordinated, and the man who commits suicide is Hoba Eiichi, a programmer who worked on the project. Shortly after his death, Labors (the mechs in the show), around the city begin to malfunction and go out of control, and it's up to the members of the Section 2's Special Vehicles 2nd Division to sort things out. However, Captain Gotoh of the 2nd Division supects that everything is not as it seems. One the the truly great things about Patlabor: The Movie is that it actually has a very good story to back it up. Granted that this is in some measure due to there being an OVA already available before the film was released, but be that as it may, the fact remains that Patlabor is one of the most well scripted anime titles around - even now. That said, anyone who's familiar with the work of Oshii Mamoru, or of Headgear, will know that their pieces are generally extremely well written and directed. One of the gripes that people have with this movie is that they consider it too wordy and tedious. The plot may appear slow to some, but don't be fooled into thinking that this is a boring movie. The story progresses like a slow burning fuse, with numerous twists and turns throwing events in a new direction. The show begins with a mystery - why did Hoba Eiichi kill himself - but investigating this event only brings up more mysteries, more conundrums, and as the movie progresses the tension continues to rise ever so slowly and gently. One of the most impressive aspects of the plot is that the viewer may not even realise that they're inching further to the edge of their seat, such is the subtlety of the build up. In truth, this movie isn't meant for kids or people who expect mech shows to be all about guts and flashy combat. This, like Oshii Mamoru's later work, Ghost in the Shell, is a show aimed very much at a more mature, more rational audience (i.e. those able to breath and talk at the same time). The main reason people complain about this film is because they think it doesn't contain enough mech on mech combat, shouting or gutsy pilots, and while one can accept that the movie doesn't show much in the way of mech action, it was never meant to from the start. The mechas in the Patlabor franchise are far more useful and utilitarian than in almost any other show, with Labors being used in many aspects of society - law enforcement, construction, emergency services, heavy industry, military, etc, etc. It's a surprisingly normal, and very "novel" (in terms of anime), usage of mechas that isn't really reflected anywhere else, and more closely follows the doctrine of the "real robot" than just about any other mech show. Which neatly leads me on to design and animation. One of the key aspects of any mecha show is the design of the robots themselves. Many purists consider this element to be one of the prime factors in whether one likes the show or not, and while I can agree with that sentiment to a degree, for me it's not the be all and end all. It's nice to know then, that the design of the mechs in Patlabor: The Movie was left to another member of Headgear - Izubuchi Yutaka. Fans of RahXephon will recognise the name as both the creator and director of that series, and his credits also include work on Gundam, Jin-Roh (Kerberos Saga), Gasaraki, and several other shows. Izubuchi's designs in Patlabor are a far cry from almost every other mech show though, and reflect their utilitarian purposes in a way that no other show has managed. For example, construction Labors actually look like they belong on a construction site, and are coloured yellow like most heavy equipment used in that industry. Police Labors are sleeker, are coloured black and white, and have flashing lights (and sirens in some cases). Each mech in the movie is designed for a specific purpose, and it's because of this diversity of design that Patlabor is lauded as the epitome of "real world" robot design by many mecha fans - something which no other anime franchise has portrayed before or since. Unfortunately for some (not for me though), the mechs play second fiddle in Patlabor, and much of the action takes place with the characters themselves. It's nice therefore, to see that character designer Takada Akemi (another member of Headgear), was on the same page as Izubuchi when it came to realism. From Captain Goto Kiichi's world weary, droopy eyed face, to Izumi Noa's perky, bubbly, and happy go lucky expressions, the characters designs are as indiviual as they come, and fit each characters personalities almost perfectly. This realistic approach doesn't stop with the mecha or character design though. The scenery is detailed and descriptive, something which can't normally be said, and the reason for this is because the prodcution staff based much of the scenery on photos taken from around Tokyo - something which is a rarity in anime (although the game Shenmue used the same method years later). As for the animation itself, it is nothing short of impressive, even now. Given that the movie is now 20 years old, the lack of CG doesn't hold it back in any way. This movie is easily one of the most well animated pre-90s productions available, and even manages to hold it's own when compared to many modern day mech offerings. The production quality is so good in fact, that it even holds up in terms of how it sounds. As a card carrying fan of subtitles, there are very few shows that I will even consider watching with an English dub. Patlabor: The Movie is one of them. In all honesty, both the Japanese and original English dubs (not the re-issued version by Bandai), are equally excellent, especially as the English dub adopts an intuitive rather than a literal approach (something which made it a rarity in those days). The cast for either dub are talented actors and actresses who are able to provide a depth and feeling that, especially in the original english dub, is rare to see. The music used throughout the film is composed by Kawai Kenji, who also provided the music for the first two GitS movies, and ranges from grand and dramatic to languid, almost calm. The choreography between visuals and music is handled extremely well, a hallmark of Oshii's directing skills, and the overall presentation is truly splendid. In terms of effects, the movie is also well served in the range and usage of the various sounds and noises. It's nice to hear mechs that sound like mechs should, and the range of noises associated with the mechs is choreographed to fit it's particular type as well. Granted there's a limit on how much one can differentiate between two mechs in terms of how they sound, but at the very least the effort was made and the movie should be applauded for that. Or is anyone going to tell me that a JCB and a patrol car sound the same? I mentioned earlier that the mechs in Patlabor: The Movie play second fiddle to the characters, and if one decides to watch this movie then that fact should be kept very firmly in mind. Patlabor is a character driven story rather than a mecha showcase, and because of this the movie has more depth than can be found in most series. While one could argue that shows like Gundam, Macross, CG, etc, etc, are also character driven pieces, one has to remember that mechs play a central role in those stories. Here though, the tale follows a very human path that is less about combat and confrontation, and more about investigation, deduction, reasoning, and working things out. Patlabor: The Movie is essentially a detective drama that just happens to include mechs, and much of the interaction of the characters actually reinforces the belief that these robots are simply "tools of the trade" rather than anything wondrous or special. It's because of this realistic interaction between the characters as they go about their work that many consider Patlabor: The Movie a classic of the first order. The characters all have their individual gripes and foibles, much like you get in any workplace, and it's the sense of normality brought on by this that permeates the show, and makes it truly special. That said, because this is a movie there's only so much development that can occur, however there is some, especially with regards to Izumi Noa and Shinohara Asuma. What sets the movie apart though, is the strong characterisations that are present throughout, as this offsets any lack of real development rather nicely, and while it's advisable to watch the original OVA before watching the movie, in truth, it's not actually necessary. Most people will find that they watch the movie first, and will watch the rest of the franchise because they want to know more about the characters, their history, how the mechs developed, etc, etc. So, will you enjoy this? Well, if you're like me, and you like a bit of detective drama coupled with conceptualisation and philosophical debate, then this is the movie for you. If you like character driven stories with a slow build up of tension then this is for you. If you like your mech shows to have a bit more depth to them then this may be what you're looking for. If you're looking for a pre-90's show that's better than Akira, then this is it. If all you're after is flashy combat, powerful mechs, cool pilots, and overly convoluted plots, then this may not be your cup of tea (but it's still worth trying anyway). And apologies for the essay, but one can say a hell of a lot about something that's truly good. Today I bring you another Giant Mech seires, but it's not Gundam. Today I'm gonna introduce you to another popular Mech seires called Patlabor. I really don't know much about this series but's really solid stuff. Think of it as a cross over of Gundam and Ghost In The Shell. What really got me into this movie was the mystery, not the battle scenes. Okay, the story takes place in the present day 1999 (well this anime was made in the 80's), and in the middle of Tokyo Bay a new building is being built. The Mobile Police force has been assembled to prevent anyone from destroying it. While this is happening a whole bunch of other Patlabor mechs have been going on random rampages. As they try to figure out the mystery to they quickly find out it's the building that's making all the Patlabor's go beserk. But how? Well you'll have to see the movie to see what's going on. As my last qoute on this, it's an anime worth watching, even though it's kinda retro. To be an anime fan you have to like many of the old animes before you can start obsessing over the new ones. Patlabor the Movie is a must see. There was a time when I believed that the only mecha anime that would provide intelligent morality with some "Oooooh, that was cool!" fighting, was Gundam. I'm sure a majority of people might agree with that. But after seeing just one movie, I can say with a straight face(hopefully, writing it "straight out" will suffice XD), that there's another mecha which has even more realism and practical intelligence. Remember the name Patlabor, ladies and gentlemen. First and foremost, this movie does several things which are completely optional and unrequired of a director to care about, but Oshii decides to anyway. He allows people to thoroughly understand and immerse themselves with his future, and surprising realistic vision of Tokyo. We, as watchers, should be aware that this movie is technically a sequel in the canon, but Oshii does us a favor by familiarizing us with the staff and crew of the Patlabor. But what is the Patlabor? How is this futuristic mecha anime different from the rest. Well, who agrees that it's more believable to minimalize worldwide conflict by simply having the robots enforce their own lands? Well, that's what the Patlabor unit is all about; policing. Oshii,a real master of not explaining his sci-fi, allows viewers to feel the difference between our world and theirs. No matter how advanced, we can always envision the future he's showing us. The movie's message is one of the more grounded and basic of science fiction stories, but it feels fresh here too, because it fits the context. With rapid accelerations of technology and an even faster need to learn and understand it, a picture of people being blinded by that overwhelming scenario is thoroughly illustrated. Mechanics reminisce about when things were clear-cut and basic, police can remember old metropolis that have been replaced by newer buildings and such. And the mecha, dubbed Labors, have things called OS'(yes, like Windows "98"), that help commanding it easier. there's still only on big weakness with the movie. It lacks impact. It's execution doesn't give off the impression that we should learn something from it, or that we are in impending danger. It just feels like it's just another standard job for the Patlabor! Well, a job where the baddie has the IQ of 200 instead of 50. You do the math. Who's seen an ugly Oshii movie? I haven't. I've seen dark, colorless, and moody, but never ugly. Mecha designer Yutaka Izubuchi, whose probably best known for RahXephon, and for designing the mecha in Gundam Char's Counterattack, should just as easily be remembered for how he presents these riot-control bots. Even though it's a bit far-fetched to see a Labor quieting down an actual street riot, it's not uncommon to see them stop malfunctioning or joyriding Labors that pile up debris as they go. Perhaps being responsible to both sides, there's Labors for domestic and policing creating one of the biggest highlights. The other highlight would be everything else! No, I'm serious. The backgrounds' multi-layers makes almost any movement beautiful, sweeping, and integrating. There's nary a time where something doesn't have that extra piece of detail. Elevator movement, forest, fortress labyrinth, urban, etc. The movie has many backgrounds, all of which are A(Akira)-class level. I love Kenji Kawai's music, but man, does he never cut loose! In almost everything he's in, rarely is he used for anything other than tone setting. He's still not a necessary component for part of the experience and thus, expendable. This is different from his performance in Ghost in the Shell, in that his music served the role of connection; it allowed viewers to see the world of cybernization as it is. Here, we're just seeing how destructive we're getting as time goes on. And other than that, the music is mostly for the battles. Very basic stuff. The score itself is fine, but what's most important is what it's for. You wanna see some of his best? Check out Moribito's soundtrack on YouTube. I'm giving extra kudos to the characters, because behavior is everything in a sci-fi; if the people don't behave like robots are new but common tools, then everything else falls apart. Likewise, if the Patlabor unit didn't treat their weapons or mechs in ways most cops do about their personal sidearm/effects they take on the job then immersion is incomplete. Personality wise, we don't have enough time to truly like them. We have enough to understand and see who they are, but we can't tell if it's only for this movie. In fact, it's quite difficult to tell whose the main character. Or to be more exact, which main character is more important. This falls into the realistic range that all of the police play parts in the story, but I digress. If this is your first time watching Patlabor, or even Oshii, you're gonna want to lower the score of this section down a couple of notches. Even though it passes with flying colors on believability, you won't see their "off-duty" natures as you would with Ghost in the Shell. What can I say, Oshii movies are slow, methodical, brooding, and passive. It takes stretches of time before we can see anything fast paced. When things do heat up, you'll want it a remaining constant, and when it dies down, you'll stop the movie. This is a common fan, who just got off the latest battle from One Piece. Let me remind you once; treat this like slowly digestible brain food, not a bag of Hot Cheetos! But even so, Patlabor is a staple of mecha-science fiction, simple as that. It deserves it for a many of reasons, but the greatest one is that we can understand it. We can truly envision the scenario and message in our future, this is even more fantastic than say the achievements of Ghost in the Shell, because here we have higher chances of putting it to practical use. Despite it's serviceability, people don't watch anime for that, which is Oshii's biggest fault. Miyazaki may preach, but at least he puts a colorful mask on when doing it. Kon may throw our brains into a blender, but at least the experience is joyous instead of murderous. The point being, that before you push "Play", know what you're watching. + A well crafted science fiction that's perfectly understandable to the average Joe. Expert art/animation with responsible designing that fits into the nature. Music that nicely sets the mood and plugs people into the experience. Ah Mamoru Oshii, a great man who can mold his characters to resemble something akin to that friendly neighbor, or that 40 year old fascist cab driver who keeps asking you whether you have a gun license...if you're reading this I'll tell you again, no I don't! Anyway, with Oshii's help and some superb voice acting (well I thought it was very fitting) the great story of another robot revolt comes to life. Of course this one's slightly different, using a very subtle reference to animals(and probably robots) knowing something that we don't, or are at least able figure it out before we do. But the major theme in Patlabor is clearly shown through the destructive force of the out of control mecha, and it questions our unbridled advancements in technology and science. In upgrading our physical society at such an exponential rate we run the risk of giving it the reigns, unless we place equal focus on cultural society, and allow people to catch up, we may just be forcing ourselves into absolution. As some of the older characters in this film complain over their outdated knowledge, so does much of the aging workforce of today still scream to be recognized. There are also some biblical references which are used in varying ways to aid the story, the most interesting of those would be that of the ark (as in Noah's Ark), of course Patlabor doesn't use the bible to the extent of Neon Genesis Evangelion. As I said before, Oshii is able to craft realistic and like-able characters, with my personal favorite being Kiichi Goto; the captian. I'd have to say the resemblance to Roy Mustang (FMA) is to close to be coincidental, but I'm not complaining. A cool, collected individual who never looses his head (well...not usually), Goto manipulates his crew of trigger happy pilots, eager cadets, and intuitive technicians to his ends. This seems to be a more efficient way of getting things done rather than constantly using his rank. The art is very well done for its time, but still doesn't hold up to modern work in terms of clarity. However it does have a rustic charm that I enjoy, and some of the urban landscapes are still impressive, high rise skyscrapers, construction sites and demolished lots all reinforcing the sense of unrestrained development. Also be prepared for a great 80's soundtrack, you know the standard that was in any great action movie, Lethal Weapon, Terminator...the never ending story. The point is you'll enjoy the funny and realistic characters as well as the at times comical animation, but at the same time you're able to dig into a solid story that doesn't just say advancement=good (unlike everyone else).